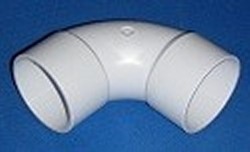 PVCFittings.com is a wholesale stocking distributor of PVC plastic pipe fittings (as well as flexible pvc pipe) and we stock most 1/2", 1", 1.5", 2", 3", 4" etc, up to 12" PVC fittings, in T's, 90's, Elbows 45's, couples, unions (11 different styles), wyes (5 different styles) bushings, reducers, etc. We also carry the 3 ways, 4 ways, 5 ways and 6 ways for pvc furniture projects. You will find our prices for PVC plastic pipe fittings very low when compared to others because you are dealing with a real wholesale stocking distributor. (For ball valves, gate valves, check valves, bulk head fittings, and other hard to find fittings, scroll down.) 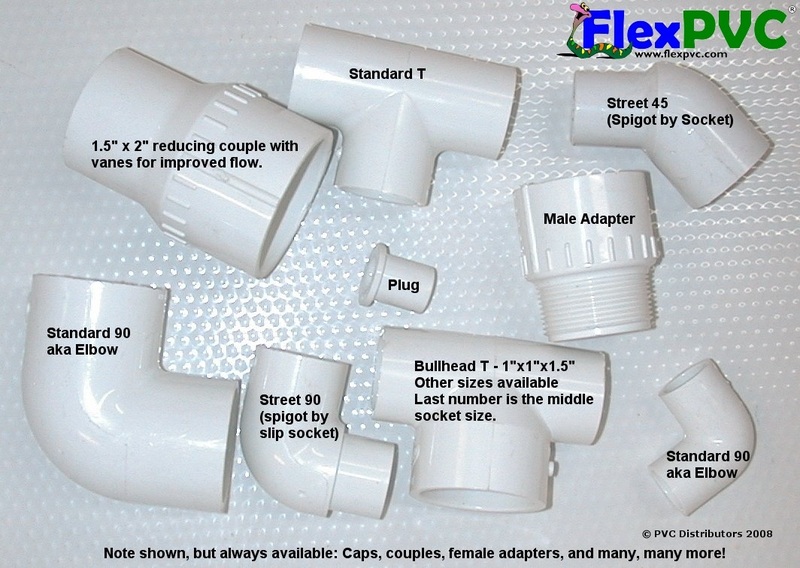 If you don't know what size you need, see our pvc pipe fittings & sizes explanation. Click here to email us for technical questions. Want to see low prices? Click here. 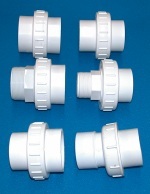 Also see More PVC plastic pipe Fittings, including garden hose fittings. Buy FLEXIBLE pvc pipe by the foot Made In The USA!. Buy RIGID pvc pipe in White, Color & Clear by the foot. Made In The USA! Buy Rigid PVC Pipe by the truckload Made In The USA!. Side Outlet 90s, aka, "pvc corners", aka, PVC 3 ways in stock! Ball Valves, Gate Valves, Diverter Valves, etc. 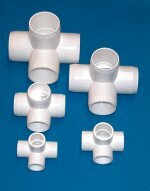 We stock a huge assortment of pvc plastic pipe fittings. Especially hard to find pvc pipe fittings like garden hose to pvc slip socket, or pvc hose barb to garden hose fittings. Of course we also stock PVC 90, 45 and 22 degree plastic pipe fittings, 11 degree plastic pipe fittings, PVC T Fittings, Male and Female adapter plastic pipe fittings, pvc couples, PVC reducer bushings, PVC Wye, aka Y, plastic pipe fittings in 1", 1.5" and 2". Some sizes available in both "true Y" and the 45 degree T/Y fitting style. We also carry such hard to find items as extra deep PVC Couples for high pressure situations, specialty fittings for the pool and spa manufacturers, irrigation fittings and plumbing fittings. And if we don't have it in stock, we can usually get it in just a few days. (Note: there are very few 5" fittings made, so if you are calling for 5" pvc pipe and/or 5" pvc pipe fittings, don't expect a miracle. A few of them we can get, but they will probably not be in stock, we'll have to special order them.) Also we can't do PVC pipe unless you can use lengths 8' or shorter. Shipping PVC pipe is very expensive and even shipping 8' lengths via common carrier (UPS, Fedex, DHL, etc) is not cheap. We will try to solve YOUR pvc pipe and fitting problems, but we can't solve all of them. Schedule 40 & 80 PVC Fittings, please click here to email your quote request for the best prices. 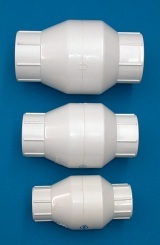 The above is just a tiny sample of the pvc fittings carry. (60,000 items) And we try to stock at least a little bit of even the strangest fitting, so feel free to give us a call toll free at 1-877-PVC-Fittings. 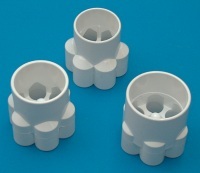 PVC Connectors, hose fittings, unions, risers and pvc hose barb fittings, and garden hose adapters are some of our specialties. 3 ways, aka side outlet 90's, 4 ways, aka side outlet T's, and 5 ways, aka side outlet crosses, also in stock, including the only 2" 5 way pvc fitting on the net! If it's a PVC fitting and we can't get it, it's probably not made! YOUR INFORMATION IS PROTECTED! All credit card orders are done via secure server, and no credit card or personal information is stored on an internet connected computer. All information is held offline for your protection & not shared with anyone!